After visiting our Eastern neighbor, Romania, last month, let us now turn our attention to another Central European country, Poland. 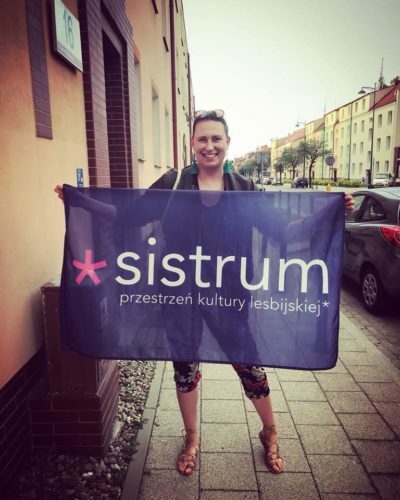 Magda, who is the co-founder of Sistrum Association - Space of Lesbian* Culture, tells us about her experiences in Warsaw and all over Poland. Hi, Magda, thanks for being here. Can you introduce yourself please? My name is Magdalena Wielgołaska, a lesbian and feminist activist-journalist. I have been involved in many non-governmental organizations since 2006, co-creating several of them. For example, I am one of the founders of Sistrum Association - Space of Lesbian* Culture. I am engaged in the political world too, being a member of the Polish Green Party. One of my main concerns is to fight for the access to medical marijuana in Poland. Tell me a bit about your wider environment. How would you summarize the general situation of the LGBTQ+ community in Poland? Our current political situation is becoming more and more difficult and more and more people are starting to feel appalled by the discrimination and exclusion of the LGBTQ+ people. The government does not provide us with security, so the community can only rely on non-governmental organizations, which are not in the best position. 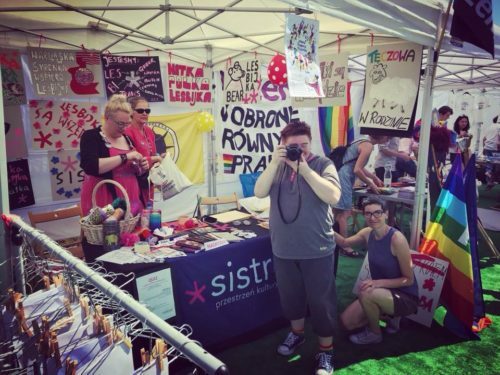 If we look at the situation of lesbians specifically, Sistrum is the only organization focused on LBTQ+ women. The position of women in our country is poor, which is why lesbians are subject to double discrimination. 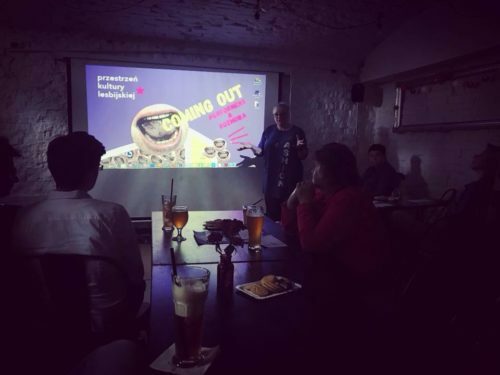 The escalation of this problem occurred last year, with discrimination against lesbians in the Polish LGBTQ+ community, which brought the manifesto of Polish lesbians to life: we began a series of interviews with non-heteronormative women living in Poland. More and more women began to speak up, which has given us a lot of power. This year, with the creation of Sistrum, a lot has changed: lesbians are regaining their strength. In Warsaw, the capital, the situation is a bit different than in other cities of the country. There are several organizations, a lot is going on, it is not hard to find events for LGBTQ+ people. This year the Pride in Warsaw was the biggest ever in the history of Polish parades. LGBTQ+ people began to get stronger. But you have to remember that Warsaw -- and Tricity, Wrocław, and Poznań -- is one of the cities to which LGBT people escape from other places. 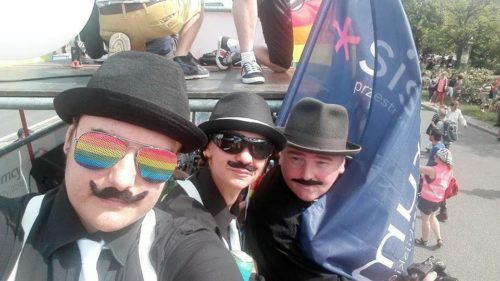 On the national level, things are getting worse: Poland is becoming more and more nationalistic, even openly homophobic. Well, we needn’t forget that Poland is a country in which the Catholic Church rules almost on par with the government, and very often the Church dictates the course of action. Currently, our constitution is being challenged by the ruling party: they would prefer to have a constitution that is based on the Bible. And that has serious consequences for the LGBTQ+ community. It is also important to note that one of the largest LGBT+ organizations is the "Faith and Rainbow," which is the organization of LGBT+ people who are believers and try to find themselves in this system. The stigma of your Christian upbringing is often the first thing you need to deal with in order to reach your true identity. Very often, Christian principles are more important than your own child, so coming-outs can be difficult in the context of the world that the Church has created. Can you reflect on this a bit please? Let us take my example. 10 years ago I thought there was no other way to be truly yourself than coming out. Now I see that it is not necessarily good to encourage everyone to come out. We need to look at this issue more widely: prepare one another for what may happen and discuss the worst and best scenarios. I've had a lot of good, but also a lot of dramatic coming-out experiences. I know stories of people who, as a result of coming out, lost their home, family, and sometimes even their lives were in danger. I'm not saying that LGBTQ+ people should not come out, but it's vital to understand what it might mean for your life and prepare yourself for it. For example, whether you are from a big city or a small village, whether your family is religiously indoctrinated, or whether you can afford an independent life if you are thrown out of the house. It is also good to know where a person can turn to in a difficult situation. That’s why it is so important you have Sistrum. Yes, exactly. That is why we decided to create an organization that will be a safe place for the perspective of non-heteronormative women. The core of the association is a quartet - myself, Maja Korzeniewska, Agnieszka Małgowska, and Monika Rak. A lot of talented women cooperate with us and they want their voice finally to be heard. For us, sisterhood means not only supporting slogans; it means specific systematic actions, which is why the mission of our organization is the production, the animation, the distribution and the archiving of lesbian* culture. For example archiving makes the lesbian* culture a part of the herstoric process, which gives Polish lesbians* a sense of continuity. One of our main tools is the project "And LGBTQ+ culture will not wait!” in which we try to show that the letter "L" is just as important as other letters in the “LGBTQ+” acronym. Enjoy reading us? Like us on Facebook! Lesbians* – a more expensive life on less money? How to dress at the workplace, or: is there such a thing as female professionalism?